Louis Vuitton began with a trunk in 1854, when a sixteen year-old Mr Vuitton introduced his flat-bottom canvas cases to the streets of Paris, creating what is considered one of the first pieces of modern luggage. Revolutionary in design, the pieces incorporated an even top and used canvas as opposed to hide. 160 years later, the iconic luggage still sits at the heart of every collection, never more so than Nicolas Ghesquière’s debut A/W14 show in March earlier this year when the designer gave each model a mini LV trunk, paying homage the brand’s heritage. The Louis Vuitton Petite Malle bag got its iconic "It-Bag" status just after it has been seen on the runway. 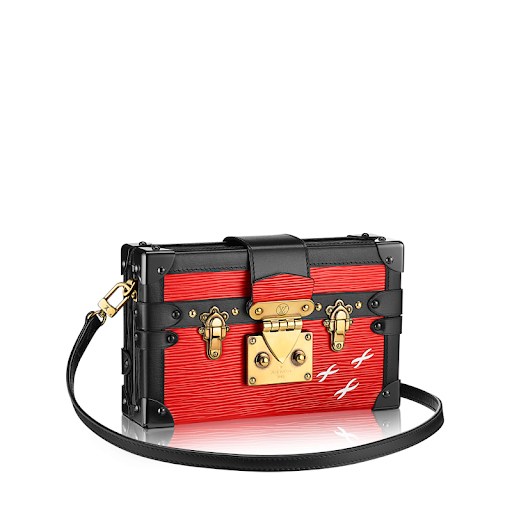 The bag’s name Petite Malle translates as "small trunk" in English. The Louis Vuitton Petite Malle is available in the classic Monogram Canvas, Damier Ebene, Epi Leather and Mettalic Epi Leather. The trim is made in Epi leather with metal hardware. Permanent collection comes with gold hardware. The Louis Vuitton Petite Malle opens from the top, making the front locks just part of the design and lined with lamb skin. It includes a removable shoulder strap and can be used as a shoulder bag, cross body or as clutch.